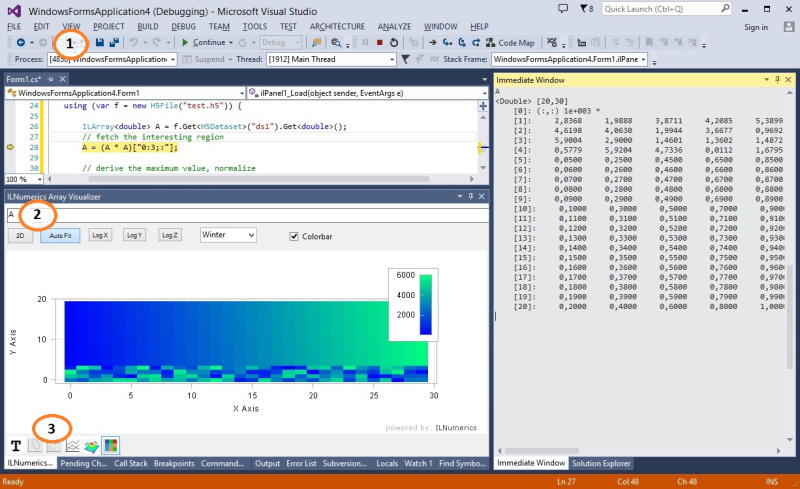 ILNumerics Array Visualizer is a graphical watch window for Visual Studio. 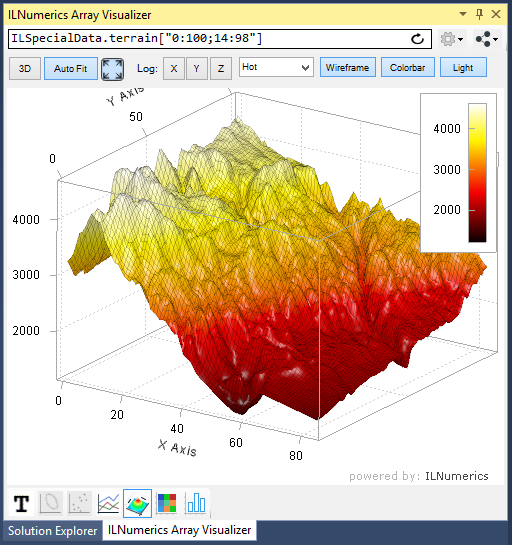 This is the only tool which combines fast data visualization with professional 2D/3D plotting and export capabilities for any .NET and C/C++ array. The Array Visualizer works for 32 and 64 bit targets. 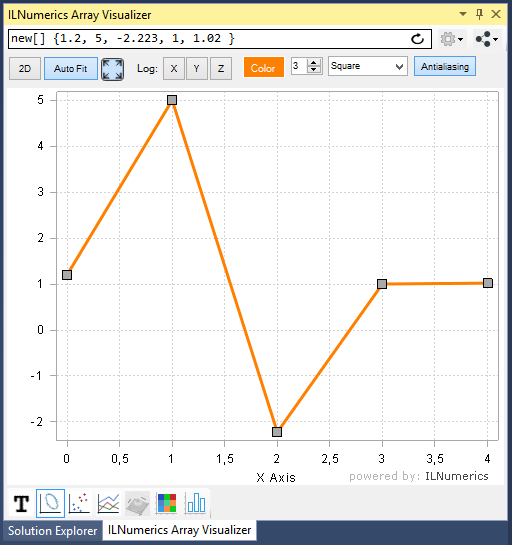 ILNumerics Array Visualizer is a graphical watch window for Visual Studio®. It helps to debug large and big data in technical applications. Itsvisual representation of arbitrary data helps in protoyping your algorithms, to find bugs quickly, and to keep the overview of your data. This speeds up the development significantly. 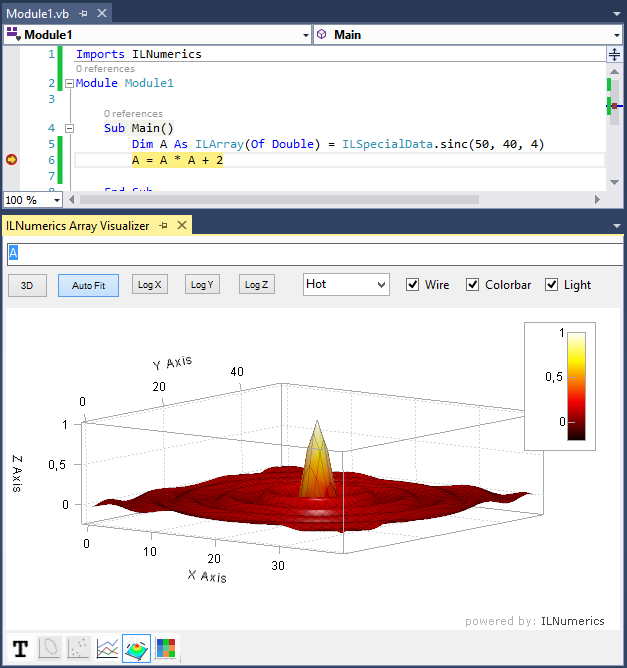 The Array Visualizer is a new tool window for Visual Studio®. It is installed with ILNumerics Ultimate VS and connects to the Visual Studio® debug engine. Arbitrary expressions are evaluated and visualized during a debug session. 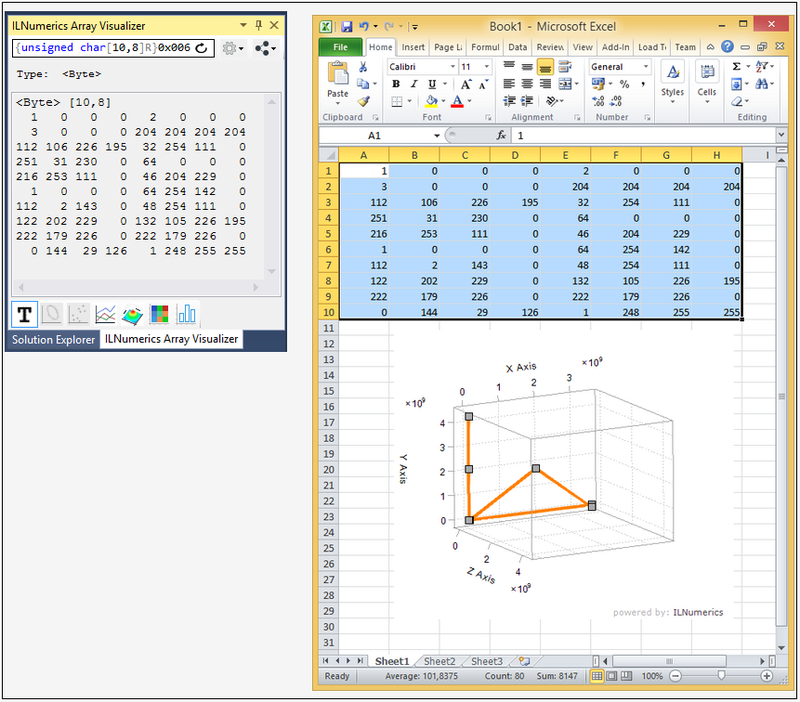 ILNumerics Array Visualizer acts similar to the Visual Studio Watch tool window - but is ready forlarge data and gives graphical output. All expressions yielding anarray (all languages) and/or a pointer type in C/C++ can be visualized. 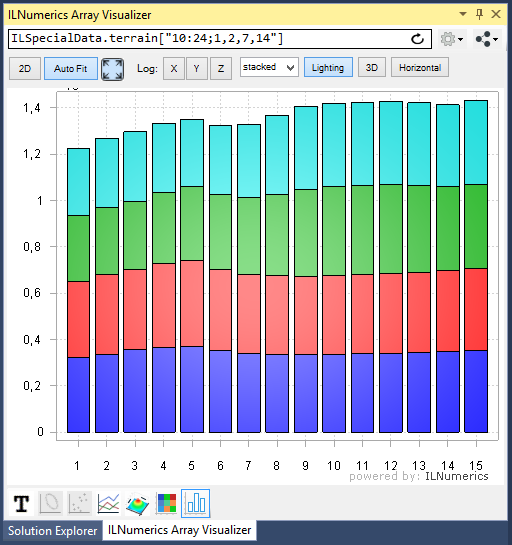 Depending on the shape of the resulting array individual visualizations become available: tabled text output, line- and scatter plots, 3D surface, ImageSC- and bar plots. All visualizations are fully interactive, support 2D and 3D views, linear / logarithmic scaling for any axis, pan, zoom and rotation with the mouse. Each view brings further, individual configuration options. Just configure the view for best data insight and watch your data change for every debug step! 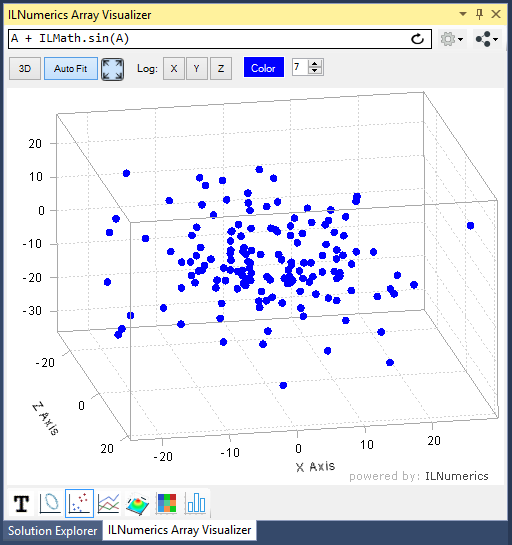 The ILNumerics Array Visualizer is made for big data visualizations. 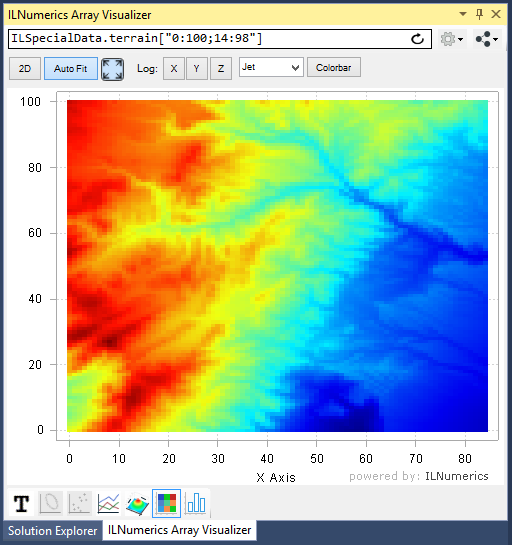 It allows to keep the overview of debug data of any size and dimensionality. 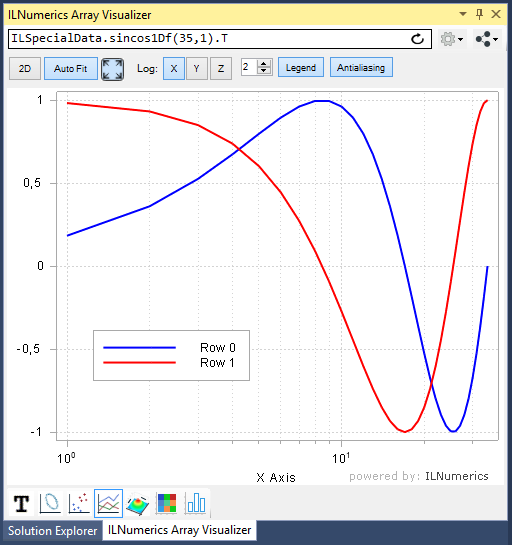 Its professional plots are based on theILNumerics Visualization Engine and allow for all popular scientific plots to be generated directly in your debug session. Visualize arbitrary un-/manged data, even void* and plain addresses in C/C++! Professional data scientists and programmers working with data of relevant size subscribe to a stand alone license for the ILNumerics Array Visualizer. Afree trial is available for evaluation.